The shivers of delight and terror familiar to those who grew up in Sykesville in the 1970s and 1980s returned this week when they heard the monster that purportedly stalked their childhood haunts would be featured on national television. The story of the bigfoot-like creature known as the Sykesville Monster will be featured on Destination America’s “Monsters and Mysteries in America” airing at 10 p.m.
Friday. E.W. Beck’s Pub in downtown Sykesville will host a viewing party with a special on the drink named after the monster, which has been on its menu for years. Although creature tales were a campfire staple prior to the 1970s, bigfoot beasts — also known as sasquatches — became a national sensation during the decade. 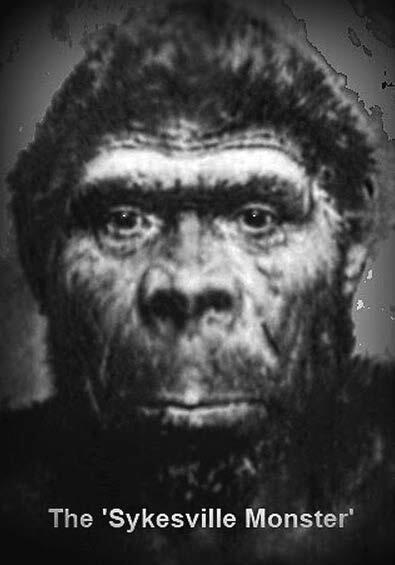 Dozens of feature films and documentaries about the creature were released along with innumerable bigfoot appearances in TV shows and specials. In Sykesville, a rash of sightings reported in 1973 led to a creature hunt that included police, a game warden, zoo officials and professional paranormal investigators. A plaster cast was taken of a footprint 13 inches long that zoo officials said could have been made by a sandal. Although no other proof was ever offered to support the existence of the monster, Main Street Director Ivy Wells, who also leads the Sykesville Ghosts and Legends tours at Halloween, said townspeople took the creature very seriously. After a sighting close to South Branch Park, police restricted access to that side of town, she said. “The whole town was basically quarantined,” Wells said. She said no official records of the bigfoot-related investigations that took place from 1973 to 1981 could be found, although police involvement was well-documented by Carroll County Times reporters, other media and eyewitness accounts. Some have speculated the missing records indicate a cover-up of additional information the government had about the creature that was not available to the public. Former Sykesville resident Lon Strickler was allegedly the last person to file a police report involving the Sykesville Monster, according to Wells. Strickler’s story will be featured in the “Monsters and Mysteries in America” episode. In a telephone interview this week, Strickler said he was fly-fishing on the Patapsco River May 9, 1981, about a mile downstream of downtown, when the creature was flushed out of the brush on the opposite bank by a stray dog. Strickler said the monster stood up to 8 feet tall and was covered in dark, matted hair everywhere except his face and the pads of his feet. “It was making a ticking sound,” said Strickler, which he took to be the sound of the creature clicking his teeth together. The creature had a strong, musky scent that Strickler said he smelled from about 25 yards away before the creature fled into the woods. Strickler went to a nearby bar to call police, he said, and by the time he returned to the site minutes later, a state police cruiser was already there. He was ordered to leave immediately, he said, but he returned an hour later. “The place was crawling with people” upon his return, Strickler said. He said he tried to get more information and called news media about the incident the following day, but no one would talk to him. He said the incident led him to investigate the Sykesville Monster on his own and write a book about his research and his encounter. These days he runs the website www.phantomsandmonsters.com and hosts a weekly radio show about strange phenomena. Growing up in bigfoot territory was an unforgettable experience for many. Upon hearing about the upcoming television show, people who grew up in Sykesville recalled the days of their youth spent scaring each other with tales of the creature or attempting to track him to his lair. But, the dark of night brought on fears of a more sinister creature. Tom Boone lives in Pennsylvania now, but he grew up in a farmhouse on Klee Mill Road. About age 10, he said he was awakened one night by a loud noise that he thought could have been the monster. “I can still hear it in my mind, what it sounded like,” he said. “I’ve never heard anything like it since. He described a whirring sound so loud it was as if it was put through an amplifier. The sound continued near the house and then moved behind the church next door and into the woods, he said. Boone said he could hear it breaking limbs and branches as it crashed through the woods. State police came after his mother called and stayed in the church parking lot throughout the night, he said. Larry Bennett, of New Windsor, spent his 1980s childhood in Sykesville. He agreed that the nights could be terrifying. He grew up on Gaither Road and often fished with his friends in the Patapsco River. “We never saw anything, but we heard things crashing in the woods and we ran away,” he said. During the day, the gang of boys enjoyed the river and the woods together. Sometimes, one in the group might sneak away and cause a ruckus with monkey sounds, he said. It was an ideal setting under the sun. However, said Bennett, none of the boys was tempted to stay out after dark. Shelley Colson Ostrum said she also experienced some nighttime chills related to the monster, especially when her brother tried to scare her; but what she remembers most about the creature is a treasured childhood memory. “How many kids get to go hunting for bigfoot with their parents?” she said. She grew up on Snowdens Run Road, and her parents took her and her brother walking down the railroad tracks on weekends. They challenged the kids to find the monster’s footprints.